Home Yoga Accessories How to Use Yoga Blocks? Why Important? Yoga Blocks, belts, blankets, cushions … These are just some of the tools that you can use to help your yoga practice. But why do we use them or why do you need them in your yoga practice? Some of the yoga students do not want to use yoga blocks during the yoga classes. They think they might have an inadequate body so that they use those blocks. Well, if you think in that way, please change your habit right now. Because Yoga Blocks serve to maintain proper alignment and proper support. Why Should We Use Yoga Blocks? 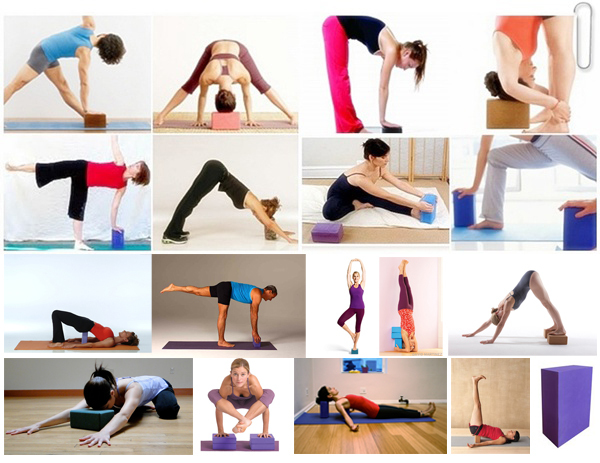 Yoga blocks or yoga bricks are considered as the most well-known and used pillars in yoga. The main function of yoga blocks is to help yogis and beginners get into postures and positions that would otherwise be difficult to do. Yoga blocks are excellent stands, especially if they have not yet developed the flexibility and flexibility that most yoga asanas require you to have. They also help people feel comfortable doing their exercises as well as help improve their body alignment. With the help of yoga blocks, you can now stretch, strengthen and align your body without causing much tension to the other muscles. These blocks can be strategically placed in your feet or hands or even your seat, allowing you to step up your yoga stretches and also achieve the correct position without much effort. This is extremely useful for beginners who do not have the flexibility they so badly need. These blocks are most commonly used in asanas such as Ardha Chandrasana and Virasana. The main objective of the block is to help the individual to find freedom when performing a very difficult asana, especially those that require stretching of the spine. They are considered to be excellent in cases where they need only a little lift or a push to open the chest or reach their feet, as long as it ensures that the breath flows easily into the spine. Which Yoga Block is Best For You? Foam blocks are most preferred as they are not very expensive, are easy to find and are easy to store. However, if you are looking for greater stability then wooden blocks are the best. On the contrary, If you want to enjoy flexibility as well as sturdiness and then block cork are the best. Yoga blocks of wood are the most traditional and the most expensive. However, they must buy carefully. The fact that they are the oldest and the most expensive option in the market does not mean that they are necessarily good for you. Solid surface and lack of flexibility can make it uncomfortable for some users. These blocks, particularly bamboo blocks, are extremely heavy and make mobility a little “a problem. If hard surfaces come out and they want some tension” between you and the floor then wooden blocks are a strict no-no. Make sure you have a cork block to support your needs. If you are unsure of the traction that will be provided by a block of yoga foam, then opting for an alternative cork is a good idea. These are some of the foam and wood blocks in terms of price and flexibility. Although it is not clear how blocks of foam, cork yoga still have a certain amount of damage, it can be very useful. Generally, flexibility is not a problem with good quality cork blocks but the cheaper versions may come out disappointed. They are generally available in sober colors and are more aesthetically pleasing of foam blocks. They are more expensive and less comfortable than foam, but textured finish can attract a lot of people. Foam blocks are very versatile. They are extremely light and give way to pressure easily, without being damaged or deformed in any way. They are easily available in the market in bright neon colors that are very attractive. If you are an amateur looking block of yoga to give the necessary support, then the foam blocks are the way to go. Be sure to choose the right size for your needs. These are excellent for both standing and sitting positions and are comfortable and affordable. Once you try the foam yoga you will not want to use any other exercise tool! How Many Yoga Blocks Do You Need? Most of the time you will only need one block of yoga, but there is a good chance you will not regret buying two. There are some advantages to buying two blocks instead of one. First, you will have a compatible set and you will not need to remember the size, brand, and color later. Second, using two yoga blocks will be essential on your practices. You will explore the balance is more strong with two blocks. Even if you think to buy two blocks instead of one can prove to be more expensive, this can save you money on shipping costs. Where To Buy Yoga Blocks? You can choose from a wide range of yoga blocks at a very good price at Amazon. You can also check the Yoga Blocks of Manduka, Gaiam and Jade Harmony brands. So, choosing yoga block is actually a personal decision based on individual training needs. The number of factors like age and flexibility will affect your decision and determine what kind of yoga you just bought the block. Make sure that all of these factors are taken into account before buying the yoga block. Next articleWhat are the Bow Pose Benefits?